Unsurprisingly, it's the cabaret number that highlights this otherwise not very interesting score from Sonik Omi. 'Aag Men Jale Jawani' is full of bounce and rich in detail, falling somewhere between the jazzy rock'n'roll of 60s' Shankar Jaikishan, and RD Burman's later sonic adventurousness. An excellent track. None of the other songs are very memorable, and the arrangements fail to excite me. 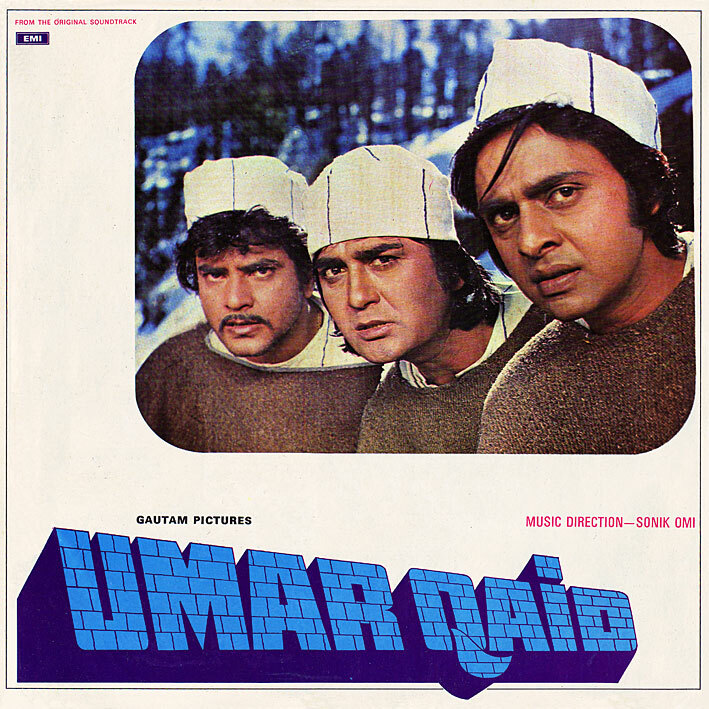 There are nice bits here and there, like the hypnotic groove on the first two (Narendra Chanchal sung) minutes of 'Kya Lekar Aaya Hai' and the psychedelic sounding intro to 'Yaad Rahega', though not really enough to make the soundtrack to 'Umar Qaid' essential. Recently discovered this great blog and have been "catching up" with what I missed. Thanks for making available so much great rare music. And your cool album scans! Especially love the RD Burman and Kalyanji-Anandji albums. Do u have "Caravan" by RD and "Apradh" by the Shah bros.? Those are both great scores besides having dancing by the fabulous Helen in the film. I actually haven't heard of this film. Thanks. this is an amazing site that has taught me a lot musically. anyone know where i can get some Cambodian jams? Where exactly do you download from? Where r u PC bro? Jah man. We miss our dose of PC! !